Boston Marathoners See The Darndest Things! 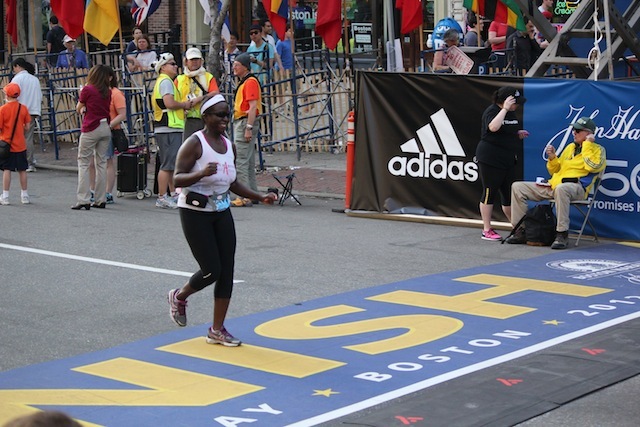 Even after four months of training, I'm not sure anything could quite prepare me for what I saw and experienced while running in the 2012 Boston Marathon this past Monday. Over the weekend, the Boston Athletic Association began sending out cryptic emails strongly discouraging anyone who hasn't won a gold medal in the last two Summer Olympics from running in the marathon and to defer to 2013 (I'm pretty sure their attorneys drafted those). But Coach Rick encouraged those of us who felt able to take the appropriate precautions and run. So for me it was a no-brainer, I was running. Arriving at Athlete's Village -the pre-race staging area--was pretty amazing. I found the port-o-potty experience slightly traumatic and saw things in the toilet bowl that I'd rather forget, but otherwise, had a great time. 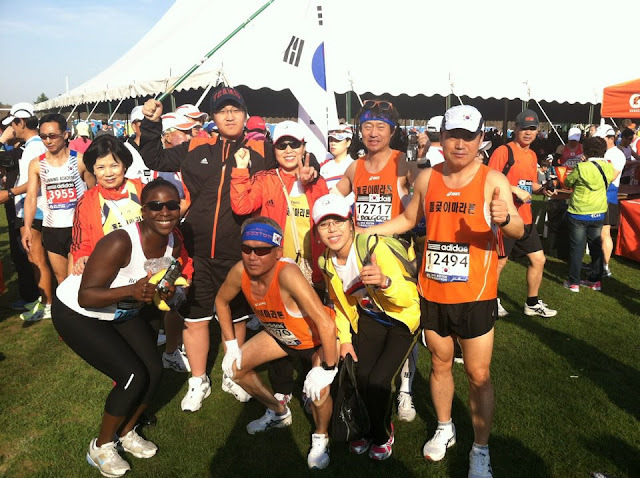 While walking around I noticed a large group of Korean runners taking a photo with the Korean flag. I walked up to the group and asked, "Can I take a photo with you?" The (Korean) photographer looked me up and down and said, "Do you know what flag that is?" "Of course!" I replied "Korea!" Geez, did she just assume I thought they were Chinese?! One of the sights that surprised me the most along the Marathon route were the many, many, many interracial families. Not so much that I saw them but where I saw them Hopkinton, Ashland, Framingham. I was like "Wow! Who knew?" I think I saw more along the Marathon route in the suburbs than in the city. Challenge the assumptions! So aside from the Kenyans and Ethiopians, the most popular runner yesterday--hands down--was Flo Allen-Hopson, a.k.a. "Momma Allen," the mother of Boston Celtics shooting guard Ray Allen. We were actually keeping pace with each other for a couple of miles (yes, before she smoked me, but it's Momma Allen so that's okay), and it was so fun seeing people realize who she was after she passed them. They'd invariably start screaming "Oh my gosh! That's Momma Allen! MOMMA ALLEN! I LOVE YOUR SON! I LOVE YOUR SON!" And she would just give a little wave and keep it moving. She is the first woman I've even seen run a marathon with perfectly coiffed hair. And this year was her third Boston Marathon. New Englanders get a bad wrap when it comes to friendliness and hospitality, but all I know is I couldn't have made it without them: the passerby reminding me just how far I'd come and how little I had to go; the other runners who came up beside me shouting "Looking good! You're doing great! "; the kids standing on the side of the road holding out handfuls of quickly melting ice and saying "Good job! "; the tailgating, Newton suburbanites who went to great lengths to give me ice and water; the people screaming from the windows of their apartments for me to "KEEP GOING! "; and yes, even the inebriated student in front of Boston College who tried to hug me. To the countless, anonymous faces that helped me make it across the finish line, THANK YOU. I couldn't have done it without you. Congratulations! That's amazing-don't think I could ever run a marathon. Thanks Wendy! I thought the same thing but am amazed by what you can accomplish when you set a goal, have a plan, have lots of help and adjustments along the way, and then execute. Remembering this whole process will definitely help me keep the other challenges I face in life in perspective! Thank you! Yes, even while running 26.2 miles in near 90-degree heat I still have race/culture/and ethnicity on the brain (OCD!) LOL. What made me notice was the fact there are kids all along the course holding out their hands for you to high-five along the route. So I'd high-five a kid and then look at the parents/family standing behind them as would think "Oh! Wow, okay. Those are YOUR parents. Both of them. All of ya'll ARE together." Lol. Yes, I'm plotting my victory for next year. The Kenyans are going DOWN. Lol.